Spring has arrived! If you are living in Germany, you might have guessed by the mention of Bärlauch in the title of today’s recipe. Bärlauch is called ramps in English, and directly translated, bear onion. 🙂 At glance, the leaves look like wide and tall grasses growing in the woods. Up close, rubbed between your fingers, they smell very strongly of garlic and onion. 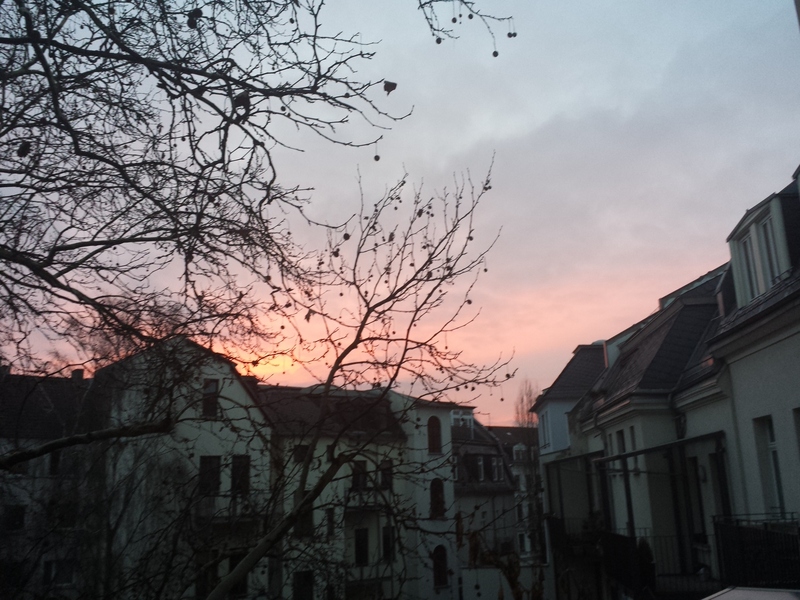 The first spring in Leipzig, I couldn’t make out where this onion-y and garlicky smell was coming from. My uni was right by the park, so the smell was kind of intense at times. In my second year in Leipzig, a Korean family invited me to eat Bärlauch pancakes at their place with Bärlauch they have foraged that day. It was so delicious. I mean, how could it not be, for someone like me who needs some kind of an allium at every meal. Since then, every year I wait for spring to arrive so I can go forage them. (for free!) 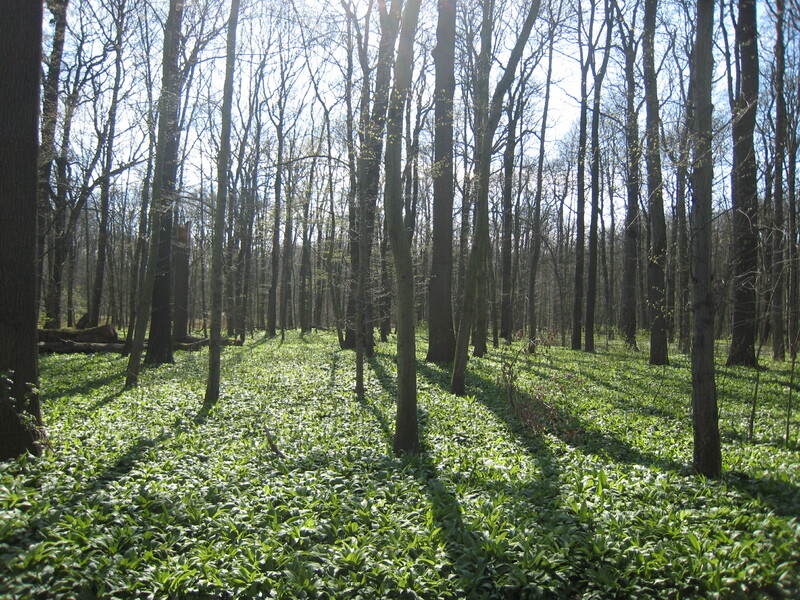 The photo from 2008 underneath is a field of ramps growing in the woods in the spring. Kimchi is the most essential part of a Korean meal. It is served at every meal (not kidding). There are many many varieties of kimchi, and every household has a slightly different kimchi recipe. I only started making kimchi myself only a year ago -shame on me- and I have to say, I was so proud of myself when my kimchi has fermented properly and tasted somewhat like my grandmother’s. I think I was steered away from making it before because I thought it was somehow super difficult to make and to ferment. (it is not). Kimchi can be made out of cabbage, Korean radish, cucumber during the summer, spring onions or chinese chives. 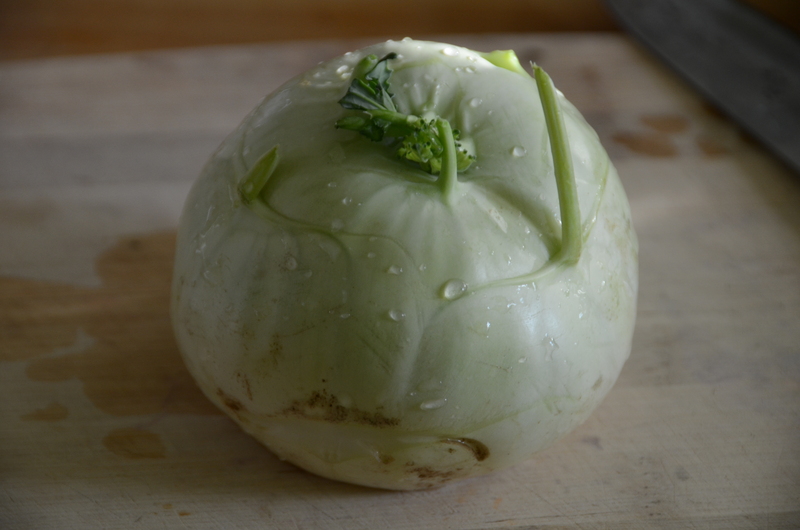 I have opted for kohlrabi while looking to develop a new kimchi recipe. To quote Yotam Ottolenghi on kohlrabi, “People often ask me what to do with kohlrabi, an often unwanted child in the organic vegetable box. It seems to healthy, too weird, too German!” (from Plenty) Yup. This explains how I felt about kohlrabi when I first saw it. Maybe I have lived in Germany for too long, but I have become fond of this weird vegetable of brassica family. It’s delicious julienned in salads, and cooked in curries. I originally wanted to use pink table radishes while developing this kimchi recipe but they don’t come in season for another month or so, and kohlrabi can be bought at any given time of the year at german supermarkets. The boskoop apple gives a sweet and slightly sour contrast to the garlicky and spicy ingredients. 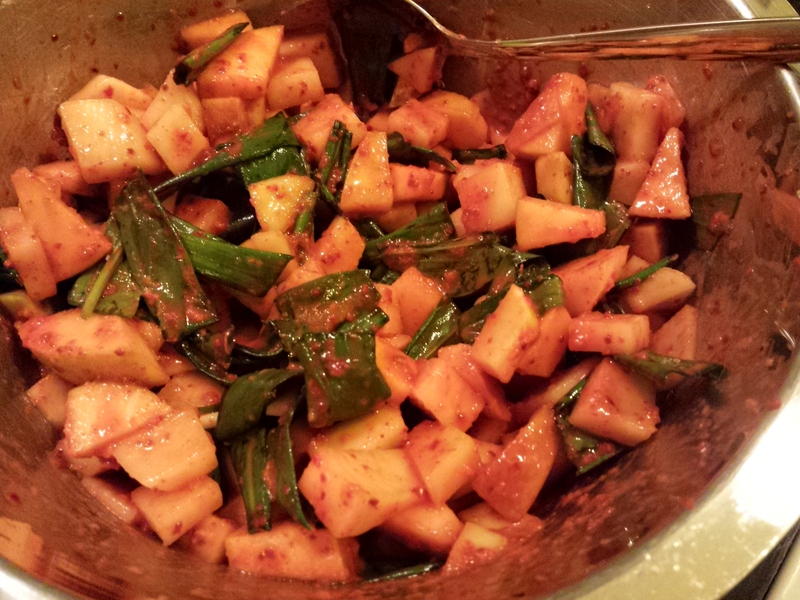 I’m not sure if my grandmas would be confused or annoyed when I tell them I have included diced apple in my kimchi. Because I added a bunch of Bärlauch, I only added a small clove of garlic. 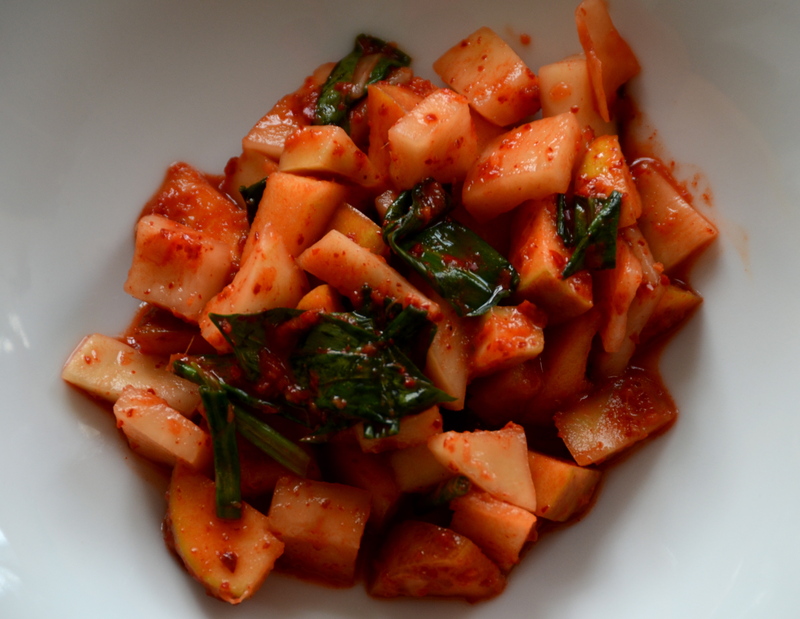 I still want you to be able to meet friends after eating this kimchi. Bärlauch can be quite pungent especially when they have grown bigger. If you can’t find kohlrabi, replace with a bunch of pink radishes. Ramps are hard to come by in some places, so a small bunch of spring onions would do the trick. 1. In a large bowl, toss the kohlrabi cubes with salt and let them sit for one hour. Drain, saving any brine from kohlrabi. Run the kohlrabi cubes very briefly under cold water. Drain well. 2. To make the sauce, sift the flour in a small bowl. Add the boiling water and whisk until it becomes a smooth paste. Add the brine, grated ginger, garlic, chili flakes, Korean fish sauce, if using, and sugar. Stir to combine. 3. Toss the kohlrabi, apple, and ramp in the sauce until well coated. Transfer to a clean jar and close the lid tightly. Let it ferment at room temperature for 24 hours before serving. Keep it in the fridge and eat within a week. It’s been a while since I posted something sweet. To be exact, I have one dessert recipe on here so far. Maybe you can tell, but I’m not much of a baker or have a particularly sweet tooth. But the other day, looking at the frozen section at a supermarket made me think about using frozen fruits in winter. I usually have a bag of frozen raspberry and strawberries in my freezer for smoothies, but I have never noticed the cherries in the supermarket. There are many jars of canned and sweetened cherries in German supermarkets but frozen ones sounded much better to bake with. They are, of course, unsweetened and natural, and pitted (!!). You have no idea how many summers I have contemplated baking a cherry pie but gave up because that meant either A. going to a shop and buying a cherry pitter or B. pitting the cherries with my bare hands. Both didn’t sound too appealing to me, so I always ended up eating them just as they are. The climate in Germany isn’t right for growing great peaches, apricots, watermelons and nectarines, but let me say, german cherries rock. The first time I tasted cherries here was at a BBQ party after a friend’s final recital many years ago. Her parents brought a huge bucket full (not joking) of cherries from their garden. I think I might have eaten at least a third of that bucket (also not joking). One can assume of course, that I had a slight tummy ache the next day from gluttony. It was worth it though. Today’s recipe is a combination of all things cherries should be paired up with. Chocolate, orange, and almond. I had a box of marzipan in the fridge from my dear friend Dobi who brought it as a gift from Lübeck. It was definitely a clever gift because she knows I love to cook, and I prefer something that I can use in the kitchen rather than a box of chocolate with marzipan. 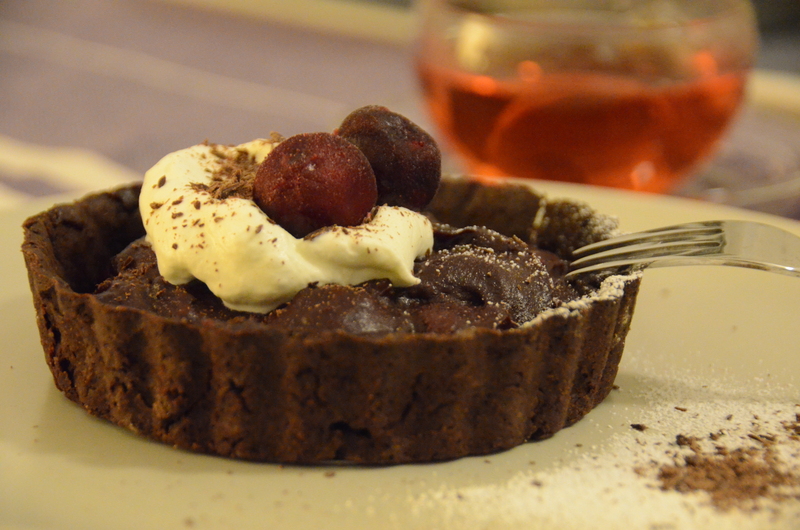 The crust for this tart is the usual tart crust plus unsweetened cocoa powder to enrich the chocolate experience even more. Next time I make this again, I will stir in the marzipan in the last minute so it retains its shape a bit. I added the marzipan to the cherries too early so they melted away. I like little bites of marzipan here and there. As Valentine’s Day is coming up, maybe some of you would want something delicious and rich like these tartlets to eat with your loved ones. I won’t be really doing anything with my boyfriend, because we are not really the ones to celebrate it. I’ll probably curl up on the couch and watch the new season of House of Cards which happens to come out on the 14th. (Huuraaaah!!). In any case, whatever you are doing, happy cooking and/or have a fun Valentine’s Day! Note: It is important to fill the tartlet cases with blind-baking beans to prevent the dough from shrinking in the oven while baking. A 500g bag of cheap dried beans or dried peas would do the job. If you have a jar of pennies, it would work just as well. 1. Make the crust. In a food processor with a blade attachment, add the flours, sugar, salt, orange zest and cocoa powder. Pulse 4-5 times to combine. 2. Add the cubed (cold!) butter. Pulse 6-7 times until the flour resembles sand and pebbles. Add the egg yolk and cold water. Pulse 6-7 times again until the dough comes together when you pinch a small amount between your fingers. Tip out the dough onto a surface or a large bowl. Knead 2-3 times (very quickly) just to gather the dough. Divide the dough into 4. Wrap them individually in a cling wrap film. Chill in the fridge for at least 30 mins. Alternately, if you don’t have a food processor, you can cut the butter into the flour with your fingers or a pastry scraper. Make sure to work quickly, and preferably with an open kitchen window, as coldness is essential in a tart recipe. 3. Preheat the oven to 180 degrees celsius. Roll out the tart dough with a sprinkle of flour to prevent from sticking. Line the tartlet cases with the rolled out dough. Prick the bottoms of the tartlet cases a couple of times. Line the top of the dough with baking paper. Fill the tartlet pans with blind baking beans or pennies. (see recipe note) Bake for 2o minutes. 4. 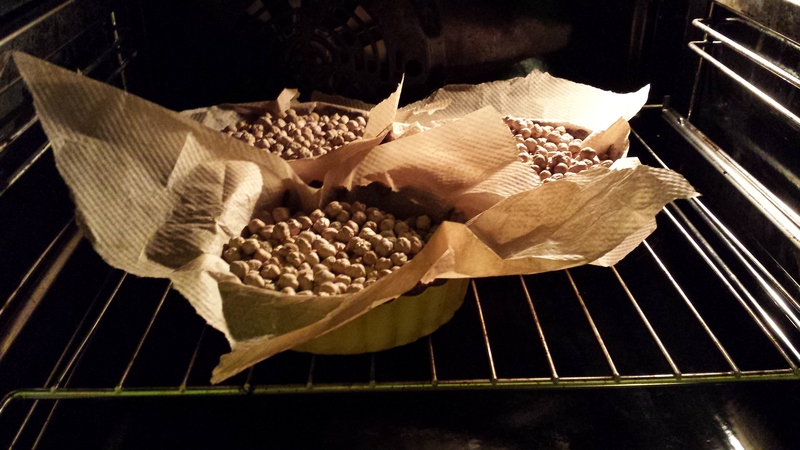 Take the blind baking beans out and bake the tartlet cases for 5 minutes further. Let the tartlet cases cool down completely. 5. Make the filling. Over a medium-high heat in a medium saucepan, add the frozen cherries, sugar, lemon and orange juice. Stir around until the cherries are thawed and start to release their juices. Add the chocolate and marzipan and stir to combine. Turn the heat down to low. Add the corn starch and stir until the cherries thicken. 6. 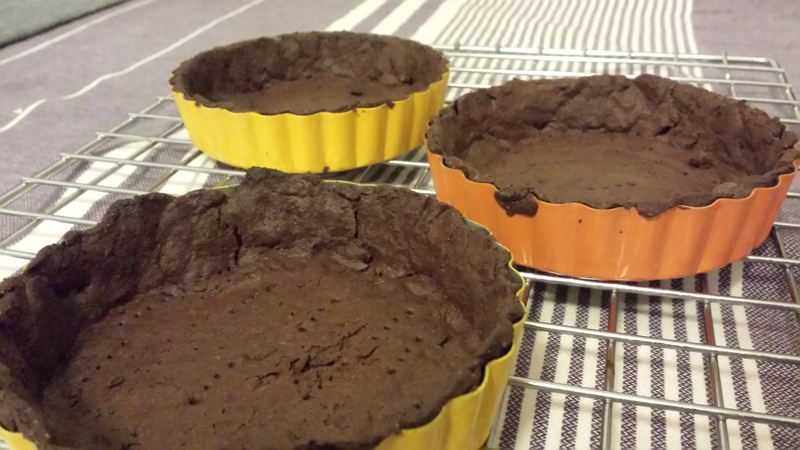 Fill the cooled tartlet cases with the filling. Chill the tartlets in the fridge or on your balcony. Serve with a dollop of whipped cream and shavings of chocolate. Anyways. Here’s a dish that will bring even more sunshine and zest to your plate. And especially to those who suffer from the worst winter ever in wherever you are, probably in the States. A friend wrote me, saying it was -17 degrees fahrenheit when she woke up. That’s…. well, let’s not calculate that to celsius. Ouch. 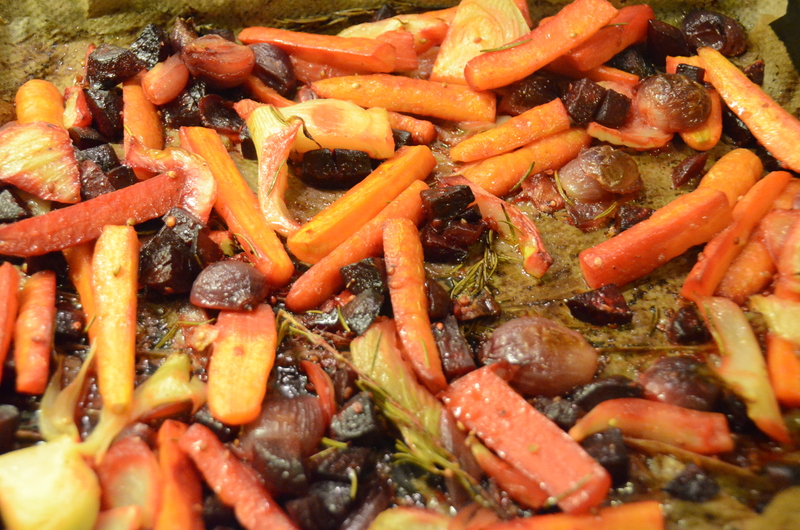 I like roasting vegetables during winter, as I’m sure many of you do too. It warms up the apartment, and it’s basically carefree cooking. Just chop some vegetables, coat in some oil, herbs, and whatever else, in the oven for 40 mins, then voilà! Your dinner is served. 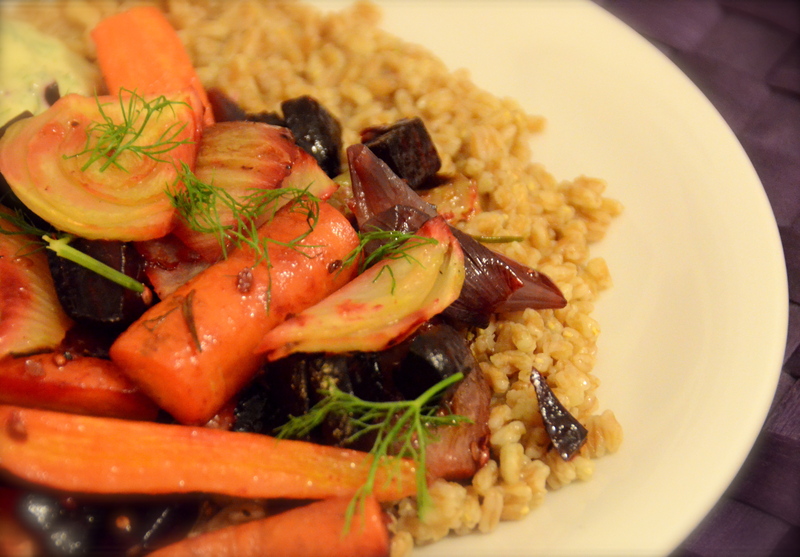 This dish I made last night involves coating carrots, beetroots, and fennel in blood orange juice and coriander seeds. Sounds weird? Not to me. Orange is a natural partner of all those vegetables in this dish. Coriander seeds, with their flowery and zesty note, pairs well with the rest of the ingredients without being too overpowering. I usually use regular orange, but blood orange was on sale at my organic store, and these oranges are blink-and-miss fruit of the season, so I thought I would make a good use out of them. They are slightly sharper than the regular orange, so I added a little maple syrup to tone the acidity down. The blue cheese-horseradish sauce gives a nice contrast to earthy, sweet, and zesty roast. I thought it was an odd idea myself when I started making it, but my boyfriend said it matched very well to the vegetables. So I trust his judgement for now. I hope you try it and tell me if they go well together. However, if you are too lazy to make the sauce, just crumble some blue cheese on the vegetables before serving. Note: Farro is called Zart Dinkel in German. You can get it at big organic stores. In Leipzig, I bought mine at Macis in the Innenstadt. If you are too lazy to make the blue cheese sauce, just crumble some on top of the vegetables before serving. Goats cheese could work as well. 500g carrots, scrubbed, un-peeled if organic. 3. Put the veggies in a large bowl. Add the orange juice, maple syrup, olive oil, coriander seeds, and 1.5 tsp salt. Toss to coat. Spread the veggies out on a cookie sheet or a baking tray. Roast for 40-50 mins, stirring occasionally. 4. Meanwhile, in a medium saucepan, heat the olive oil over medium heat. Add the finely chopped onions and garlic, and fry gently until softened. 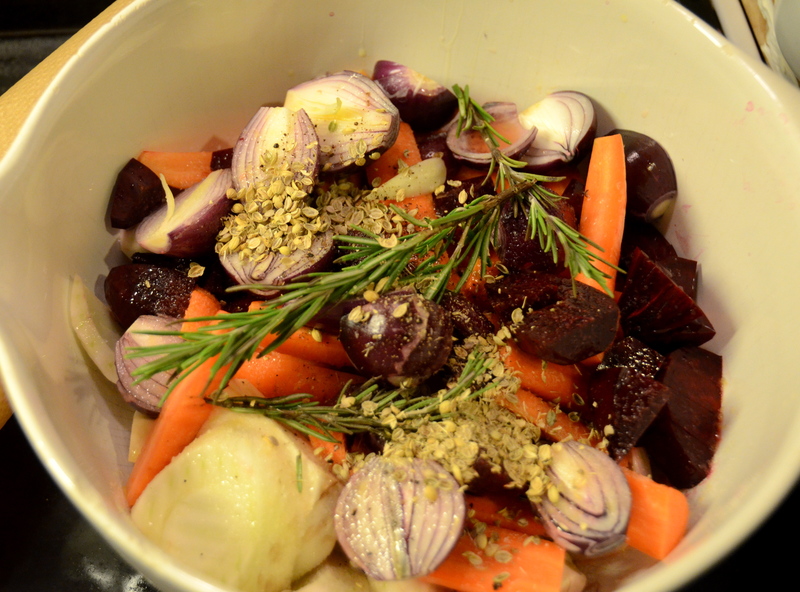 Add the farro and vegetable stock, and a big pinch of salt. Cover, bring it to boil, and let it simmer for 15-20 mins until tender. Let it stand for 5 mins before taking off the lid. If there is too much water left in the pan, drain briefly and put it back int he pan. Fluff up the grains. 5. To make the sauce, mash the blue cheese with fork. Add the rest of the ingredients and whisk to combine. 6. To serve: Either on a big platter or on individual plates, spread out the cooked farro. Add the veggies on top, including any juice that’s left in the pan. You can either serve the sauce on the side, or on top.